Square nine in the corner is related to the carpenter's square. See square nine for a discussion of the abstract shape. When there are no outside liberties, White can turn this into sente seki . The vital point (obviously) is a. The points and are miai. 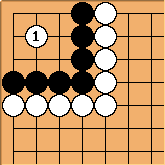 avoids White starting a ten thousand year ko at a. This way avoids the ten thousand year ko as well. 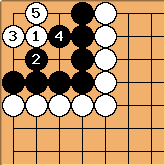 Now Black's eye space is almost filled with a bulky five, and Black dies. 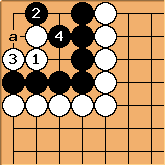 This becomes seki too, but if Black omits 6, the ko started at is slightly more advantageous for Black in that he can capture first (try to get first capture in a ko). here is not so good, as it invites a two stage ko. 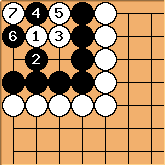 This variation also becomes seki (even an 1 zi better to White one, in chinese scoring), but White ends in gote. 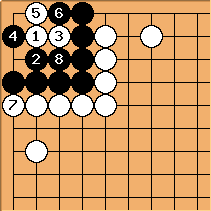 Black trying to avoid seki by taking away the eye is not a good idea because it becomes seki anyway and Black takes gote too. Black must play at . Otherwise white can kill. See 3 (iia) below. Black is dead after . 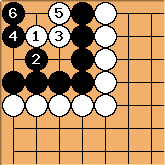 White would not normally have to play out the rest of the moves. 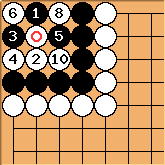 With one outside liberty the same main line applies, except that White must play in gote at to make it seki. With two or more outside liberties, the attempt to make seki fails. to are better held in reserve as ko threats. This position is hyperactive, depending on who is komaster. 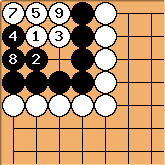 If Black is, or if neither player has any ko threats, White can make seki in gote. Think about it. What does White threaten? White can try , but takes away the eye. Now what? 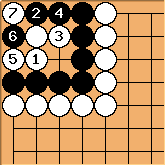 This leads to a 10,000 year ko, which White will be reluctant to start. 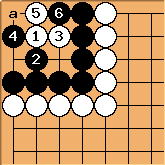 Or White can play at a to preserve the seki. 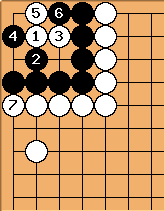 When White is komaster, things are trickier. White threatens to . 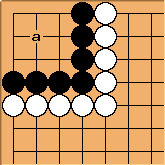 Now there is a 10,000 year ko that favors White. Unless Black can become komaster, he should often go ahead and bite the bullet with . 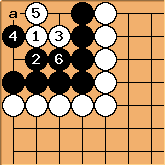 Since he will lose the ko, the earlier he does so, the larger are the plays he gets in exchange. 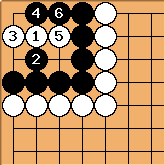 By the same logic, Black should normally reply to White's invasion, setting up a ko to lose while there is still time. Black makes ko to lose it now. , , Black 11 elsewhere. 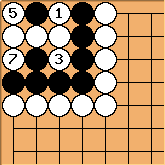 After White starts with , Black gets three plays elsewhere in exchange for the corner. The right time to do this is when the miai value of these plays is around 7 points. 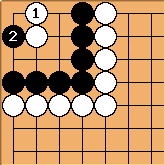 When he cannot get so much in return for the ko, Black should usually make seki in gote, as shown in the Main Line diagram.